JTC inventories Rego's 4286, 4289, and 4291 series inertrol regulators. Three stage nitrogen regulators especially designed to maintain oilfilled transformer atmospheres at 0.5 PSIG. 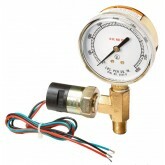 Each inertrol outfit consists of a two-stage regulator connected in series to a highly sensitive single-stage regulator which maintains the 0.5 PSIG pressure. 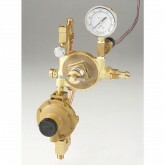 A built-in pressure relief valve in the third stage regulator helps protect against over-pressurization of the system. These inertrol units are designed for oil-filled transformers manufactured by ABB, Inc., General Electric, and Cooper Power. Some outfits are equipped with an alarm switch that activates a customer equipped warning device should the cylinder pressure drop below 300 PSIG. Heavy duty brass and aluminum construction resists corrosion and provides for longer life. The 4289 series incorporates a special by-pass valve to allow for quick filling of the transformer. Hidden pressure adjusting screw helps protect against tampering by unauthorized personnel. 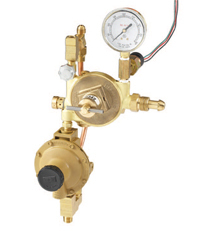 Large diameter diaphragm in the third-stage regulator provides for sensitive and precise control of the gas flow. Maximum inlet pressure - 3000 PSIG.